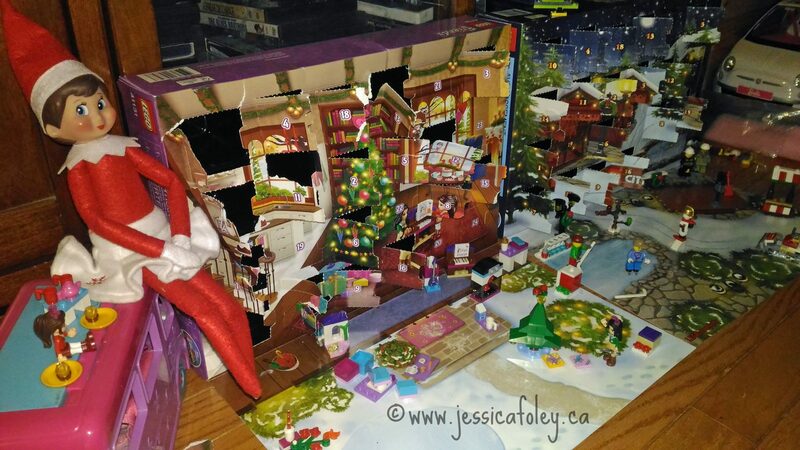 Elf On The Shelf – How Many Years Will This Go On? My daughters are now 6 and 9. We are still smack in the middle of believing in Santa, the Tooth Fairy, Easter Bunny and every other mythical creature. And this includes Elf on the Shelf. This year will be our 5th Elf on the Shelf year. I can feel Emma approaching the end of the fantasy believing stage of childhood. I’m confident she’ll keep up the charade as long as we want her to – she’s very indulgent of her little sister! But it’s a little sad to realize she’s growing up so quickly. Now that my girls are older, getting Elfie Sparkle into more fun and interesting hijinks is so much easier. As I talked about in last year’s Elf on the Shelf post, they totally understand the “no touching” rule, but also that it can be broken if Elfie made a big mess. 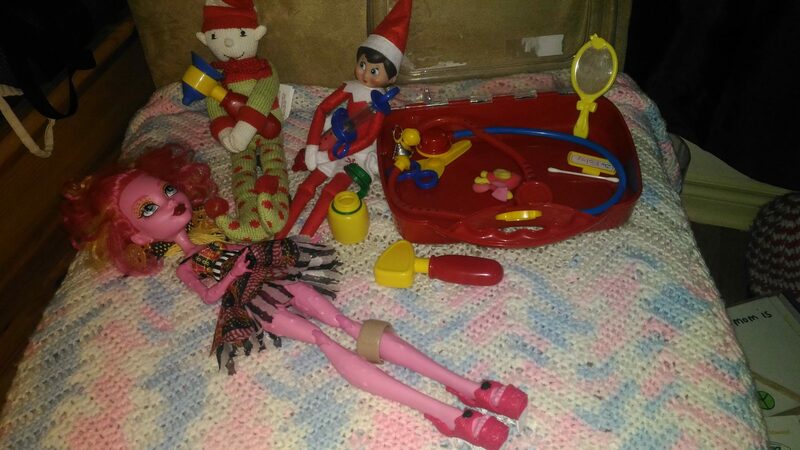 Mom and Dad have the all-powerful ability to move Elfie if and when her hijinks need tidying up in the morning. This year Elfie is bringing the girls chocolate advent calendars. Every year previously it’s been something a lot more “fun” – Lego or Playmobil advents which take a long time to deal with in the mornings. We have so much Lego and Playmobil so we discussed this with Elfie and she agreed to bring something a little more “classic” this year. We’re hopeful it won’t be so intrusive in our morning routine. Plus, who doesn’t love a little chocolate with breakfast? 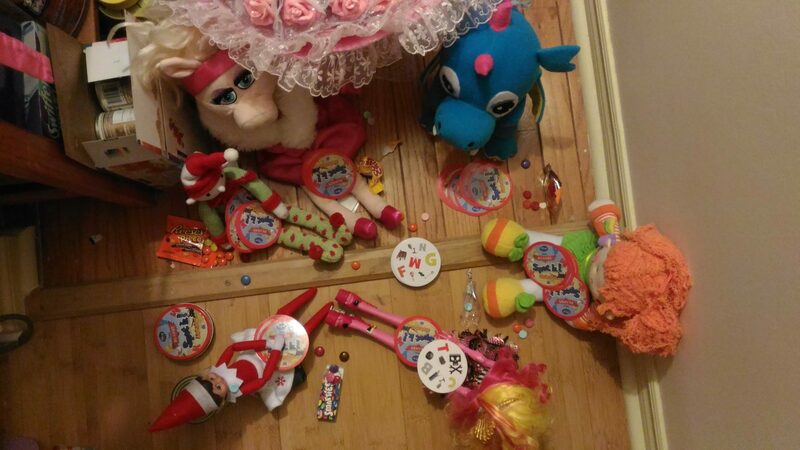 Here are a few photos of what our Elfie Sparkle got up to last December. Nothing too wild and crazy, but she did seem to be having some fun! I hope to practice some artistic photography with Elfie Sparkle this year. I’ll send out the good ones in my email updates. If you’re not on my email list yet, get on there*! Then make sure you’re following me on social media (I’m modernmomslife on all platforms – though I’m not on Snapchat. I don’t quite get that one…) so you can see some more of the fun we get up to with our Elf on the Shelf. Have fun with your own Elf on the Shelf this season! Here’s an affiliate link to order your own on Amazon: Elf on the Shelf We have the girl (as you can see) but there is a boy available, and tons of accessories if you want to go really crazy! LOL! I was just saying this same thing the other night! My boys are aged 10-13 and all still firmly believe; our elf has been with us since my oldest was 5. That’s 8 years of elfish antics and now that my boys stay up as late (sometimes later!) than me it’s getting quite hard to do much of anything creative with our elf at all. I’m sure our years are numbered though and so I will keep on and try to enjoy their faces each morning as they find him just a bit longer. Oh the Tooth Fairy – that’s a whole other game, isn’t it? But ya, it’s much the same idea. You know I have heard others say it can be creepy. I enjoy it, though sometimes regret starting it (as I said in my post.) I’ve done fairly well this December, so yay for me! It is hard when they’re young, or too rambunctious to not touch the elf. Mine are old enough now so Elfie can get up to all sorts of mischief and they will look and enjoy, and still not touch. While I’ve never “forgotten” to move the elf, I have come very close a few times. Luckily I get up before the kids most (work) mornings, so a last minute move is possible for me!